New Dog Training classes starting soon! We offer puppy classes and three levels of obedience training. Our dog training techniques create smarter dogs through mental stimulation and foster a bond of mutual trust and respect between you and your dog. All of our dog training classes focus on real life applications teaching your dog to be sociable, obedient and reliable in everyday situations that they will encounter. Socialization and communication are the building blocks necessary for your dog to get along with its own kind. We provide a drop-in socialization class for puppies and young adults to be able to play off leash & burn energy. For more reactive dog behavior, we offer a specialized class for dogs that need some extra help with socialization. If you would like to go a step further with your dog we provide agility, scent detection and a preparation course for your dog to become a certified therapy dog. For every day needs, we also provide dog walking and pet services. We are currently accepting new clients for dog training and dog walking. We serve Cambridge, Kitchener, Waterloo, Guelph, Ayr, Dundas and Hamilton. 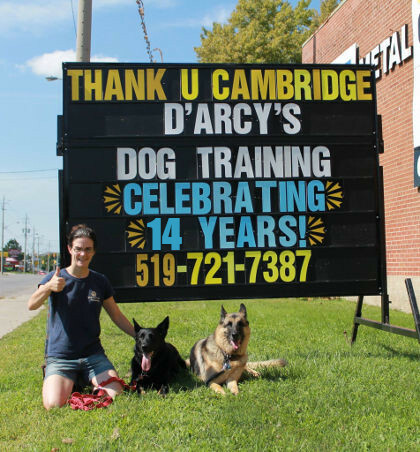 We are located in Cambridge Ontario. We are close to the delta at the intersection of Hespeler Rd. and Dundas St. We are an easy 10 –15 minute drive from the cities of Kitchener/Waterloo. Our Passion is Dog Training and Walking Dogs! Contact us or call or text (519) 721- Pets (7387) for more information.